Mysterium Novum is a multi-media concert produced by the classical music group Nouveau Classical Project. 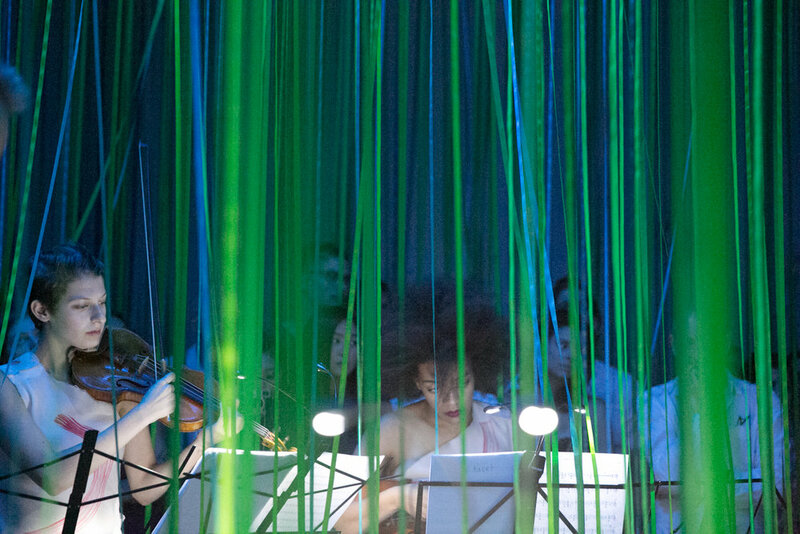 NCP commissioned a group of artists with synesthesia (including Rhee) to work on various aspects of the concert. With an original piece of music by Paul Haas, a set by Anne Patterson, the concert’s scent and costume design was the prompt for Atelier de Geste. Rhee created a series of painted silk organza collage costumes, portraying her experience of synesthesia while listening to Paul Haas’ score. The fabric is first hand-painted with movement strokes. Then, they are cut into fluid organic shapes, draped & collaged on the mannequin, then sewn/finished on machines. The process is jazz-like, intuitive, primal, and labor-intensive. The many-layered technique creates the final pieces, ‘garment-collages’ that are each alive and different. 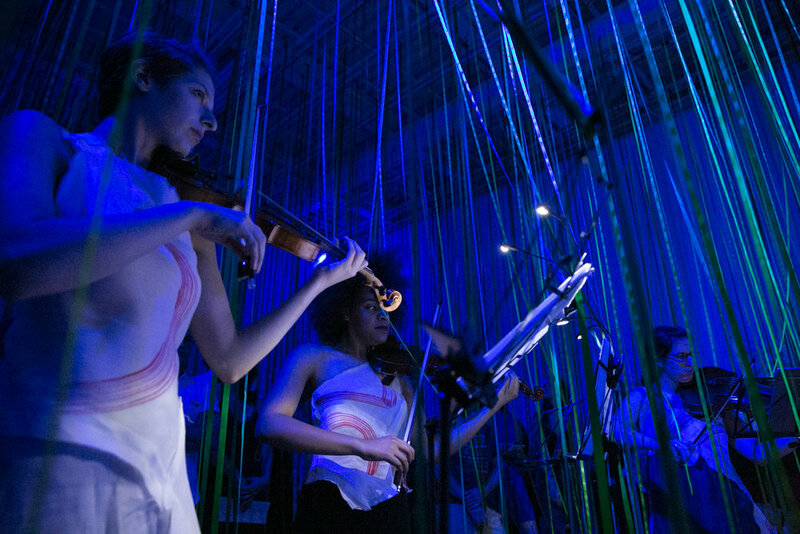 The scent worked directly with Anne Patterson’s concept, creating a forest of sound and texture, and enhancing the embodied experience of the set. Press release: "The Nouveau Classical Project (NCP) presents Mysterium Novum, an immersive art installation and concert experience inspired by synesthesia, a neurological phenomenon where stimulation of one sense involuntarily triggers another. Synesthetic artists often find their condition to be a natural source of inspiration in their work, such as composer Alexander Scriabin, who related colors to music and believed his synesthesia heightened his intake and creation of art. Mysterium Novum is a new interpretation of Scriabin’s Mysterium, an unrealized production that was designed to simulate the synesthetic experience. Mysterium Novum features a forest of lush ribbons by synesthetic artist Anne Patterson (2013 Artist-in-Residence at Grace Cathedral) embedded with 10 instrumentalists performing a new piece with electronics by Paul Haas (“Visionary” -Time Out New York), scents and costumes by Atelier de Geste (Art and Olfaction Award nominee), and lighting by Jeanette Oi-Suk Yew (MET Museum, BAM, St. Ann’s Warehouse, The Kitchen). Audience members can freely roam around this forest and touch reactive flowers created by Joel Mellin (Head of Technology at Sudden Industries). Mysterium Novum for flute, oboe, 2 clarinets, string quintet, keyboards, and laptop by Paul Haas World premiere, commissioned by The Nouveau Classical Project"